Larva Breeding is a High-Tech Industrial Outbuilding that grows on Medium and High density Industrial Zones. 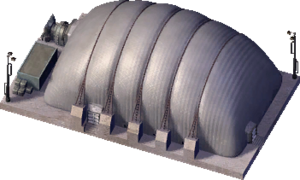 Larva Breeding may be based on a Bag-Style Anaerobic Digester, though a Bag-style digester would not be used on the scale depicted by Larva Breeding in SimCity 4. This page was last modified on 14 May 2014, at 14:46.